What is a solution for maintaining and improving infrastructure to protect one of our most valuable resources in Southern Chicago and northwestern Indiana? As magnificent the Grand Canyon in the West, at a much smaller scale, the Midwest now relies on the McCook Reservoir for water protection. This tunnel and reservoir project, better known as TARP, construction began back in 2000 as a massive flood and pollution reduction project, evolved to better manage storm water and biosolids. The pre-existing Thornton rock quarry deemed worthy of the 10-billion-gallon project, recently opening Phase I of the reservoir and deep tunnel, while Phase II is still in progress of being quarried (with an estimated completion in 2027). The current reservoir measures 3,000 ft wide by 310 feet deep, while the connecting Deep Tunnel with retractable flood gates measures 20 feet diameter and 109 miles long. The deep tunnel is required to provide adequate conveyance of combined sewer outflows (CSOs) between O’Hare, McCook and Thornton reservoirs. 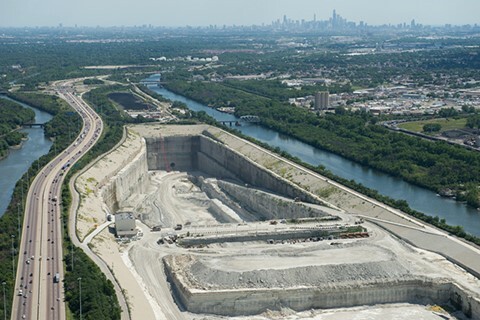 TARP managed by Metropolitan Water Reclamation District of Greater Chicago, when finished, will be the largest tunnel/reservoir in the United States.